Loop over alll of the files in the folder. 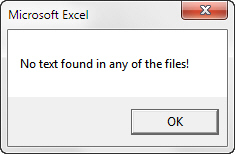 For each file, check if it's an Excel workbook (see if the file extension is .XLSX or .XLSM). If it is, open the file and try to find the hidden word using the Find method. As soon as you succeed, close the workbook down and abort the process, reporting what you've found. Now that we've written our algorithm, it's time to code it! Note that the function tidies up after itself (it closes down the workbook that it's opened). 'no errors - can finish! MsgBox "No text found in any of the files!" MsgBox "Can not find a folder with this name!" 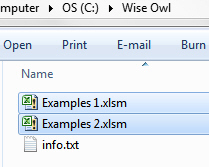 For this example, the macro will open the files shown selected only, since they are the only ones whose file names end in .XLSX or .XLSM. An example message displayed by our macro - here Fu-fu was well hidden! The message yoi'll see if none of the workbooks contains the hidden text. That's the end of this worked example - the next one shows how to find all of the files on your hard disk whose names contain a certain string of text.